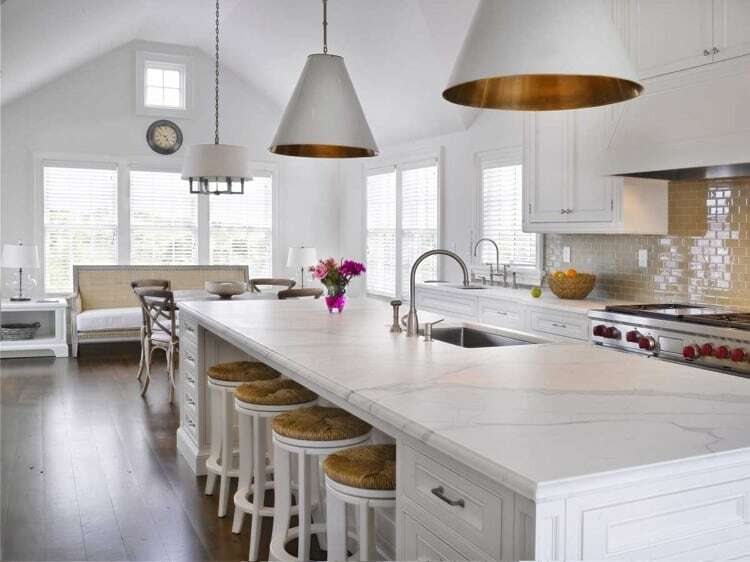 In terms of emerging trends, the kitchen of the year 2019 is a special place, combining sobriety, comfort and natural colors. The trendy kitchen plunges into an atmosphere of comfort and conviviality and combines the ergonomics of the storage space and the sobriety of the lines. Its interior favors colors and materials that breathe nature. To successfully decorate and decorate your kitchen, take a look at our selection of ideas and let trends inspire you! 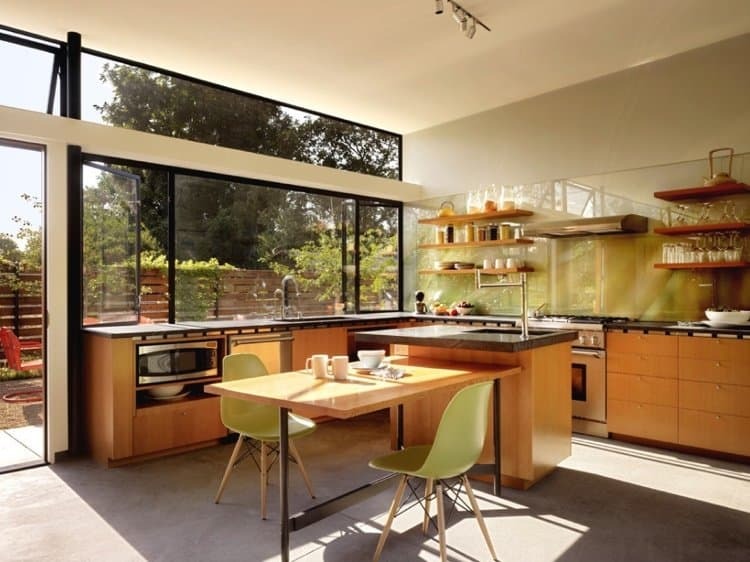 Being the heart of the home, the kitchen is a special place where there is conviviality. Today, it has become a meeting place where people prepare food, share their daily lives and welcome their friends. That is why it is important that she be immersed in a warm and pleasant atmosphere. To succeed in creating such an atmosphere, we advise you to bet on sober gray tones. To properly organize dishes, utensils and all kinds of storage boxes in your kitchen, it is practical storage that will come to your aid. 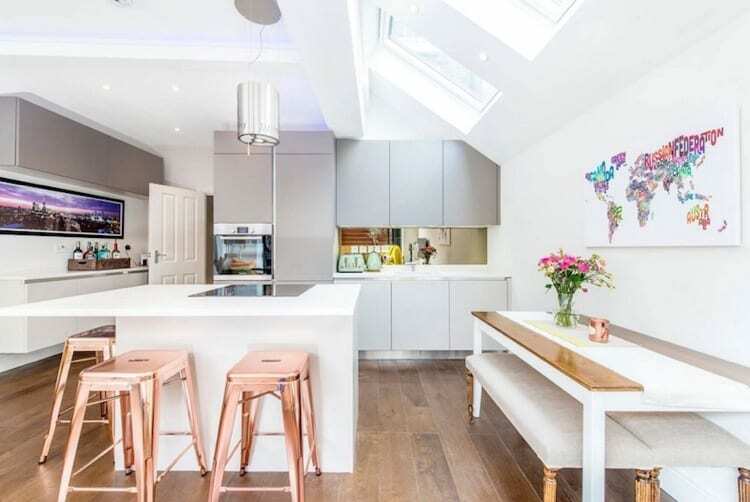 Storage ideas in the trend kitchen of the year 2019 are really clever and take advantage of every nook and cranny. Whether it is storage suspended above the central island, wall shelves above the worktop or storage hidden behind gates, this range promises to make your kitchen a perfectly organized place and harmonious. The trendy kitchen is decorated with accents reminiscent of the 80s, such as shiny metallic mosaics, copper details and shiny surfaces. 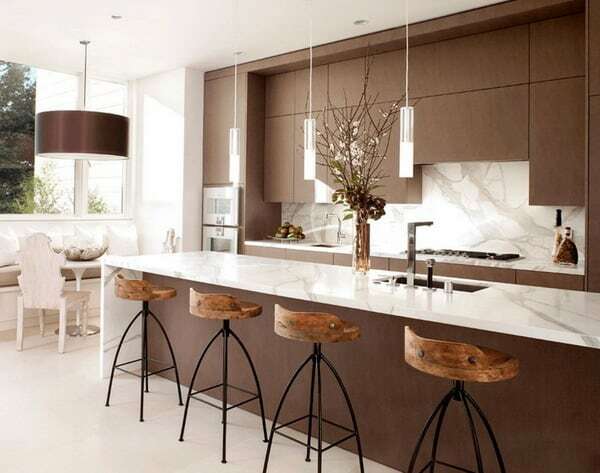 A refined elegance, is incorporated today in the design of the trendy kitchen. 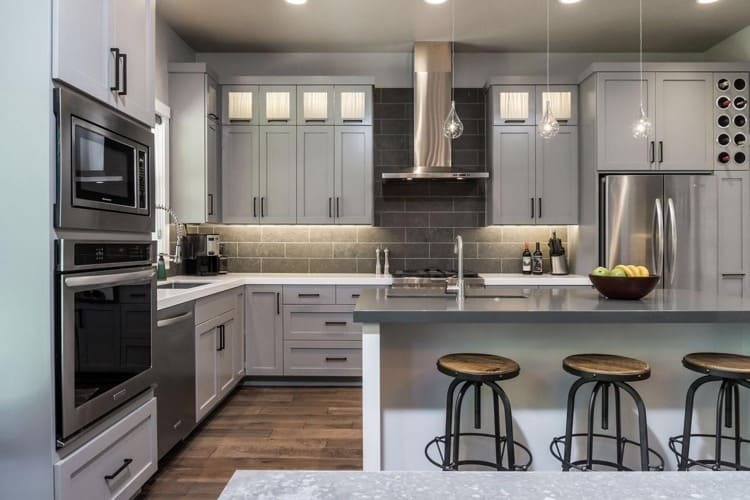 In 2019, metal will play an important role in the trend kitchen and it will replace the predominant wood, as an accent, until today. 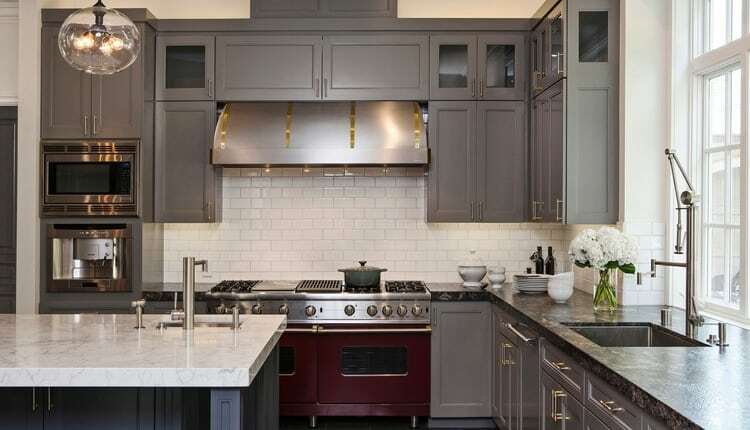 Opt for a stainless steel, copper or brass extractor hood and you can be sure to follow the current trends in the design and decoration of contemporary kitchen. As already mentioned, usability is one of the characteristic points, describing the interior of the trendy kitchen. Open the kitchen to the living room and you will succeed in creating a truly warm, elegant and comfortable atmosphere. And as the kitchen is at the heart of the home, being open to the living room, it will become the nucleus that will reunite the family. To give you a pleasant atmosphere to prepare food with great pleasure, bet on white as the predominant color. This color blends perfectly with natural materials such as wood and marble, which find their place in the contemporary kitchen of the year 2019. 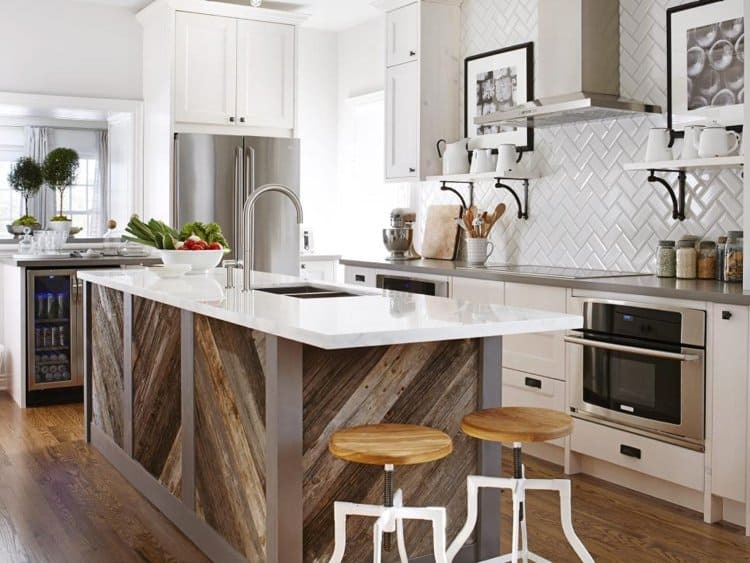 Go for a warm solid wood flooring that will make the atmosphere really warm and for white marble worktops – a material that will ennoble the kitchen. No more strong contrasts in the contemporary interior. 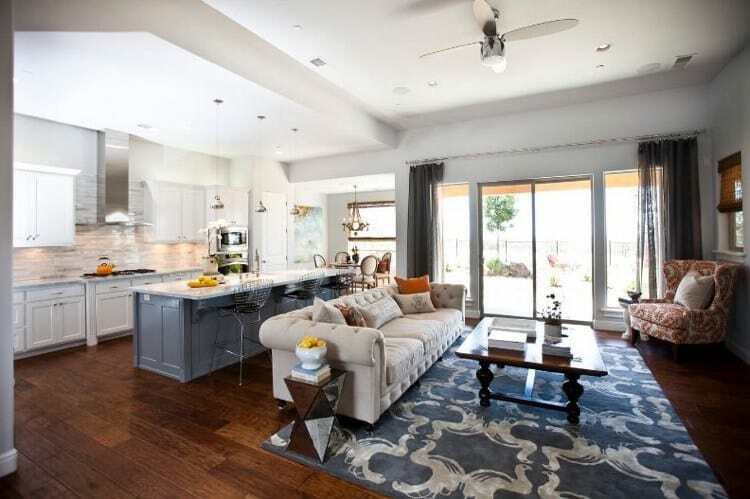 Instead of mixing strongly contrasting colors, designers prefer to “scatter” matching accents throughout the space. Thus, they bring a feeling of space and depth. 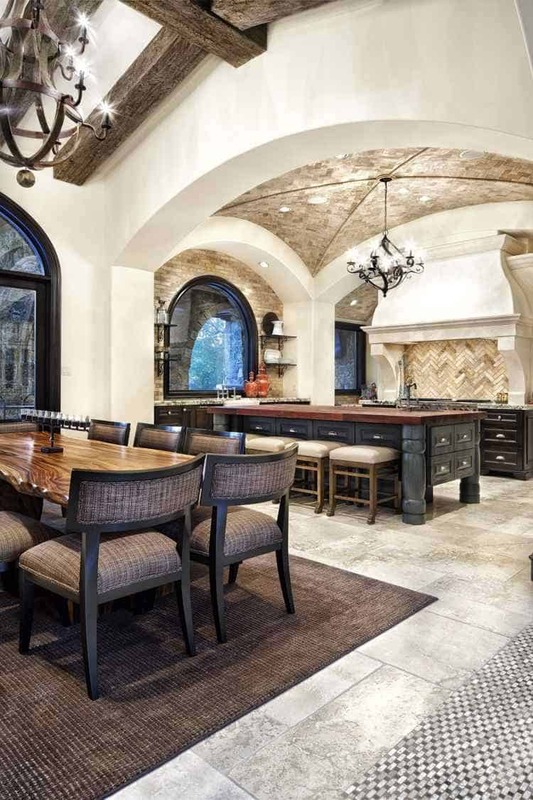 As you can see above, only one type of natural stone has been used as flooring, ceiling and wall. An idea simply noble! 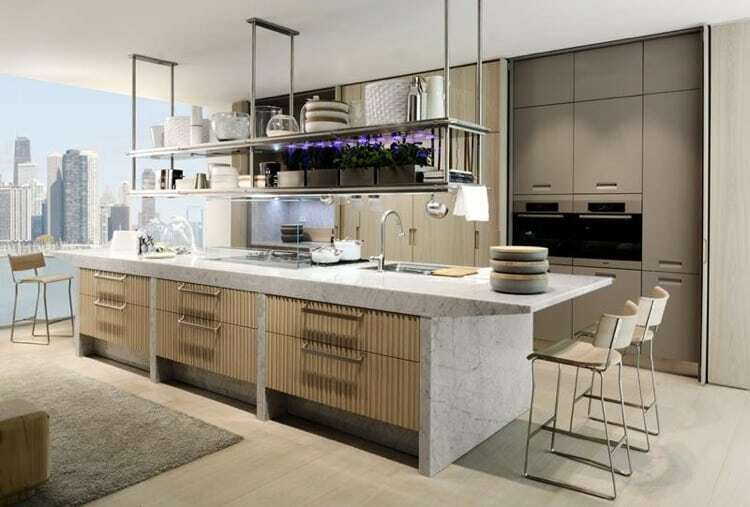 Open shelves, sleek furniture, discreet metal accents and plenty of white – that’s how we can describe the trendy kitchen of the year 2019. An excellent mix of both styles – Scandinavian and minimalist, this kitchen is a harmonious place, inviting to sharing and conviviality. If you lack color, dare contemporary home appliances that, apart from being very practical, have a very elegant appearance. 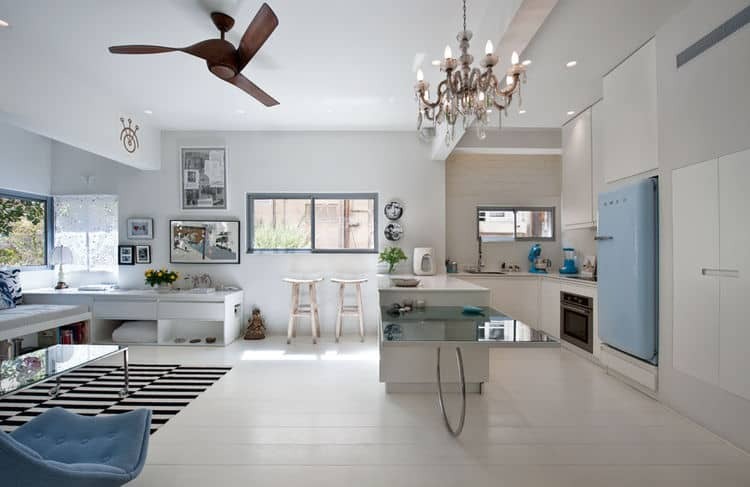 A pastel blue fridge, for example, will give life to the monochrome white kitchen in a very delicate way. In addition, it will contrast nicely with the rest of the furniture and create an image that is both modern and harmonious. 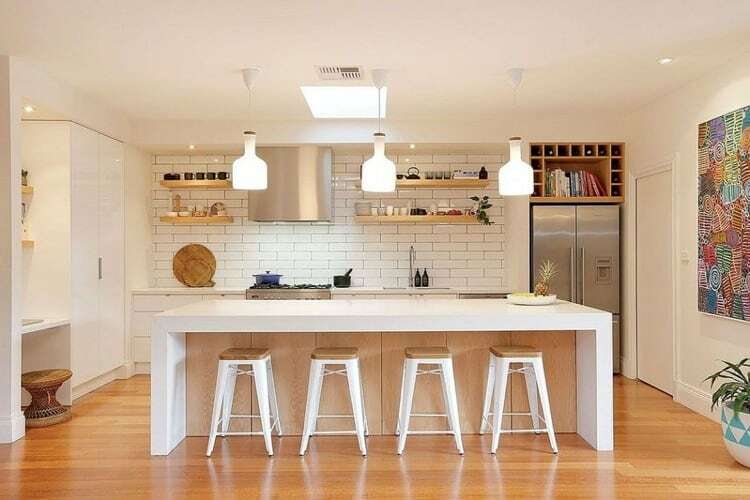 Good lighting is a must-have in any kitchen, be it modern, vintage, country style etc. Concealed lighting under kitchen cabinets illuminates the surfaces you use most often, such as countertops, for example. Installed above the furniture, the spots will focus on certain areas at your leisure and create a beautiful play of light and shade in the kitchen. The kitchen in white and black never goes out of style! 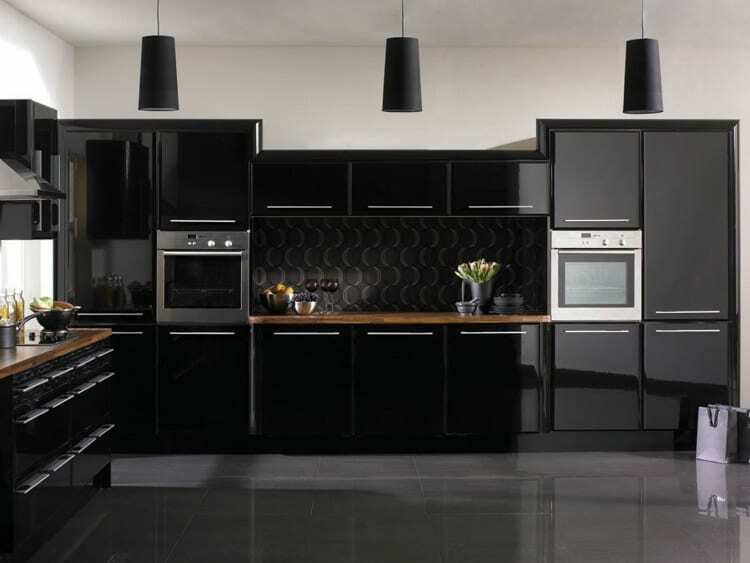 In 2019, trendy kitchen focuses on black as the predominant color. The dramatic color is ideal for small spaces because the game of black tones can enlarge the small kitchen in an optical way. 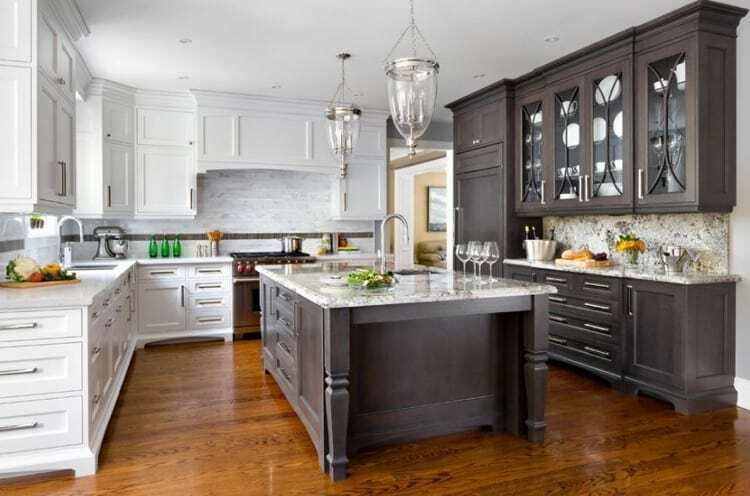 Take the risk and dare the black kitchen so elegant and noble! Who said we had to match the colors of the cabinets in the contemporary kitchen? We are in 2019 – the year of experiments in colors, textures and materials. Opt for mismatched cabinets and you’ll discover that the contrasting colors will make your kitchen even cooler and cooler. In 2019, it’s the open shelves that are making their comeback in the trendy kitchen. Install them vertically to get the most out of wall height and you’ll be able to increase storage capacity in the kitchen. Dare open shelves and we promise that they will help you better organize the space. 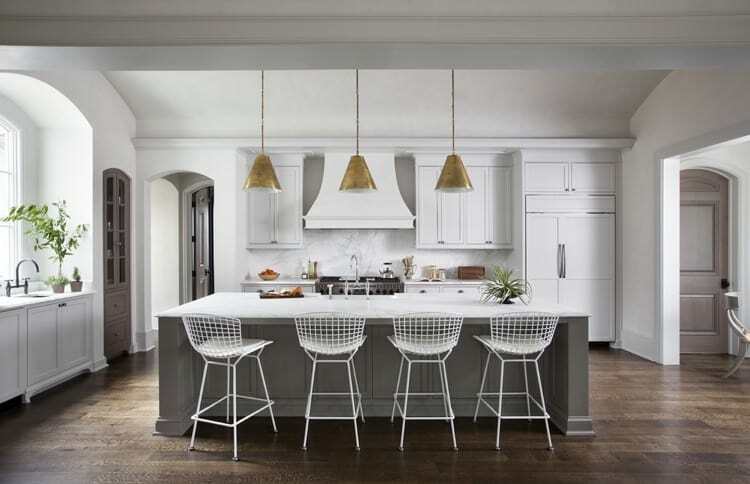 According to interior designers, each kitchen requires three types of lighting – basic lighting, lighting to illuminate a given area, and accent lighting. We have already mentioned the lighting hidden under the cupboards, so, we will pay attention to the suspensions – the lights of the year 2019. They can be suspended above the island, the bar breakfast or above from the dining area. 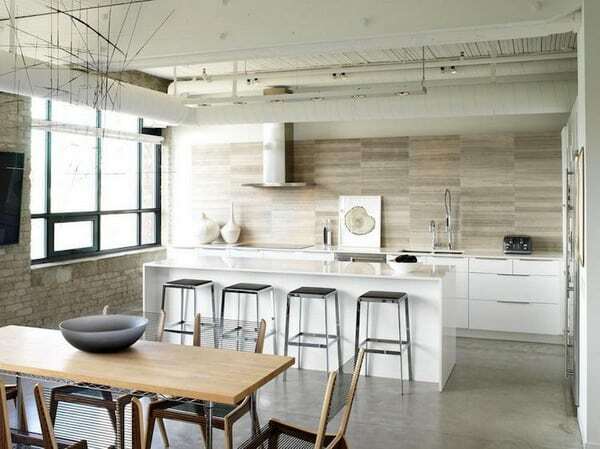 One thing is certain, the suspensions will bring a touch of elegance and give the kitchen a contemporary look. To refresh your kitchen or simply add an eye-catching accent to it, we advise you to dare the color sink. Get rid of the ordinary and boring sink and get yourself a catchy sink of bright color. And as metals in contemporary cooking are part of today’s trends, consider building yours with home appliances or pink gold accessories. This noble tone will make your kitchen more welcoming and bring a touch of warmth. Apart from playing a functional role, the kitchen credenza is part of the decor in the trendy kitchen. Composite wood is one of the most decorative choices because it offers many solutions in terms of colors and patterns. 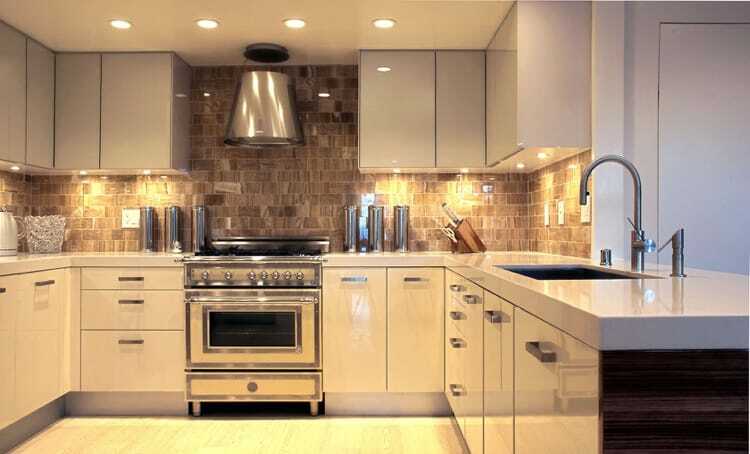 Combine it with white furniture and you will succeed in giving your kitchen an elegant, modern and classy appearance.